The Ritual of the Four is a young adult paranormal fantasy written by Carla Trueheart. Shaw Huntley is on the run -- literally. He and his mother have so far remained just a few steps ahead of the scarred man and Shaw’s cousin, Alexander; the men who killed Shaw’s father and who will stop at nothing to get Shaw’s dagger. Each time they catch up with Shaw, he and his mom are packed and ready to go, once again, to yet another town, a different school, and with a new set of names. Shaw, Alexander, and the scarred man have a peculiar set of skills that runs in Shaw’s family lineage; they can slash and cut their victims using the power of their minds. Shaw’s powers are unusually strong and hard for him to control; once he has visualized that dagger in his mind, the object of his anger is cut. When they move to Rockpoint, New York, a quiet little upstate New York town, Shaw is prepared for yet another short stay before they have to leave, but the welcoming committee at his new high school, in the form of a game-playing girl named Melody, gives him just a few reasons to want to somehow make this stay last a little longer. Carla Trueheart’s young adult paranormal fantasy, The Ritual of the Four, is exciting and action-packed. The author has written a spellbinding and highly imaginative story based around an ancient ritual that had created binding powers passed down through the family lineages of its participants. Shaw and Melody are authentic and compelling characters who work together to decipher the clues and puzzles that are all that’s left to help them stop the relentless and deadly pursuit by Alexander and the scarred man. 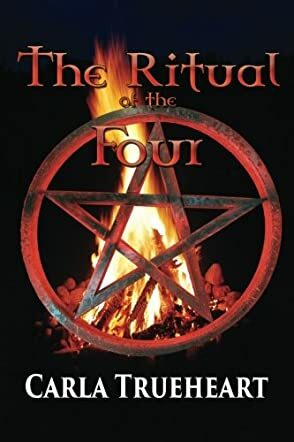 I enjoyed every minute I spent reading The Ritual of the Four and had a marvelous time teasing out the coded message and other clues along with the two protagonists. This is a fast-paced story that’s filled with adventure, suspense, and just a bit of romance. The Ritual of the Four is wickedly good, and it’s most highly recommended for contemporary fantasy fans of all ages. This baby boomer can't wait to finish reading The Ritual of the Four. Don't have to be a young adult to enjoy this story by very talented Carla Trueheart. This YA novel has some fun occult-ish supernaturalism, romance, and action. The characters are appealing and I especially liked the relationship between Shaw and his mother. Basing the supernatural story on the four elements and symbols is appealing and grounding. I don't usually read this genre, but enjoyed the story. I think the intended audience will find it a great contribution to YA fiction. I was lucky enough to win this book through one of the Goodread Giveaways. Carla was kind enough to send me the Silver Seal edition, autograph it, and include a note and bookmark! I really enjoyed the book and had a hard time putting it down. She did a great job of adding in those little details that really humanize the characters and make them relevant to the intended generation. This book was so much fun to read! Once I got to about the midway point I couldn't put it down! I needed to see how Shaw and Melody would figure out the secret to The Ritual of the Four!! I'm not sure where to begin with my review of this book. I purchased it through a Halloween promo and thought it was going to be a violent gothic fantasy, but it was actually about a teenage boy and his life traveling around to new schools, a romantic triangle with two girls, and an ability passed down to him from his dad that he really wanted to get rid of. I was actually glad that it wasn't a full-on fantasy but I guess I could say it did have fantasy elements, like the dagger and the goblet. All of these were cool to read about and I learned a few things about symbols of magic elements. At the end, when Shaw and Melody go looking for the map, it really picked up and I kept reading without putting the book down. That's something I rarely do. I give 5 stars for keeping my attention and for Shaw's story and the magic elements. The map stuff was good too, especially the skeleton and the way the symbols were used on the map. Fantastic! So much fun to read, could not put it down!! This book starts with a bang and moves along quickly. A teenager named Shaw has inherited two gifts from the father he lost (an artifact and a magical power) and is now being hunted by men willing to kill for those gifts -- one of whom is a member of Shaw's own family. On the run with his mother Shaw can't even hope for a normal life, unless he is willing to relinquish the things his father died to give him. That is, until he meets Melody, who gives him the courage and motivation to stop running away and instead to use his gifts to take the fight to his enemies and end the chase, once and for all. I enjoyed the budding love story between Shaw and Melody, complicated as it was by Shaw's troubles and that familiar horror show we call high school. The backstory of the gifts Shaw received, and how they interconnect with other artifacts and powers revealed in the book, was interesting and entertaining. The first-person narration provides excellent insight into Shaw's perspective, although at times I wanted to smack some sense into the kid. Luckily, Melody was there to handle that, more often than not. But that same tight perspective limits the ability to understand the motivations of the other characters, and sometimes the choices made by Shaw's mother, his cousin, and at least one other character in the book were extremely odd. It's tough to say more without spoilers. Overall, this was a fun and fast-paced ride, with a good mix of puzzles to think through and white-knuckle action. I would recommend this for YA fans and those who like a bit of magic and romance in a mostly realistic modern-day setting. A friend recommended this book to me and it was fantastic! It made my commute to work fly because I was so engaged in the story line. This is a great gift for the holidays for anyone that loves adventure and fantasy. Looking forward to reading more books by this author in the future. This is a thrill-a-minute story. I'm hoping it's gonna be a series, because I really liked the characters and thought of them even when I closed the book. It's about Shaw, who is a teenager and his kinda gf Melody, who really likes him even though he might accidentally cut her if he gets mad at her because of his dark ability. Kinda like Twilight, but not vampires, he just feels like he might hurt her if he's with her that way. There are clues to follow in the middle and end and these were really done well. I liked the red orb and the map they followed to the grave. Only reason I didn't give five stars is because of some swear words. I didn't like Ariana who tried to date Shaw either. She was not nice. But I did like the book alot. I learned about the magic elements and liked the wand and the goblet too. Loved the relationship between Shaw and his mother! What a great book! I enjoyed the mystery and excitement of the adventure and the characters became so real to me that I felt like I knew them. The flirtation and romance between Shaw and Melody brought me back to those wonderful early feelings of love. A surprisingly entertaining book! Five Stars! A fun fantasy adventure for teens with a little bit of romance, too. Shaw is a memorable character who is flawed like any teenage boy. His quest to find the truth about his connection with his father's gold dagger is unforgettable and will keep the reader moving on and on. My favorite part was the discovery of the map and the magic elements represented as symbols. Recommended to fantasy lovers and lovers of teen fiction!